Betsafe bookmaker, currently owned by the Swedish company Betsson, was taken over in 2011 to improve its base of active players. Betsafe was founded in early 2006 and after 5 years, when the takeover by Betsson Group took place, they had a base of active players of over 420,000. At present, they have over half a million customers in over 100 countries. Betsafe Sportsbook offers competitive odds for a large number of sporting events focusing largely on the major leagues and competitions. *Bonus T&Cs apply. 18+. New users only. Betsafe offers more than just sports betting. Users will also find here casino sections. Is it safe to bet on Betsafe? In the online betting industry, having a strong reputation is directly proportional with the years on which the brand was around and gathered its clientele. To build a decent reputation as a credible, strong entity can be a long and tedious process. But it turns out that not all the time those points mentioned above are necessarily true. You can build a strong image in just a few years if you have the right strategy laid out. This was the case with the online sports betting and betting platform called Betsafe. Betsafe is one of the youngest betting platforms that had tremendous success in a relatively short span of time. The platform launched in the year 2006 and from there it expanded at a very rapid pace, today being one of the top betting website around the world. Betsafe launched 11 years ago just with the sports betting section implemented on the website that is betsafe.com. In 2007 they have implemented the Poker and Casino section, opening up the website to a group of new customers. Another 3 years have passed and Betsafe launched their Live Casino experience. At that time the platform had 130 employees. In 2011 the shares of the company got acquired by the Betsson Group and helped turned the evolution of the brand in a whole other direction. As of now the company thrived even more and started to catch up with the big players in this field. Betsafe is available in 100 countries around the globe and has more than 450.000 customers worldwide. A quick analysis on each section will make and then at the end you can read our conclusion. Now let’s get started. Sports are the way humans compete in a friendly and entertaining environment. The first competitions are dating back hundreds and hundreds of year, so we can say that it’s in our blood somehow. But times have passed and now we are having hundreds of sports available and thanks to the computer and internet now we are competing from the comfort of our own setup right from the laptop. As sports progressed, the betting process evolved also, in what we see today in online sports betting. The Sports category on Betsafe is placed in the menu as the first position. This tells us that on the website is one of the first categories that was implemented and also that is the most popular in the whole website. When you click on it you will see all the sports types placed in the left site menu and some quick links in the middle of the screen with the betting slip on the right side of the canvas. Thus far it’s a standard web interface for an online bookmaker. Let’s explore it further together. The competitions and tournaments for each sport are listed underneath the main category. After deciding on a betting strategy, as you may know, clicking on the odds will make the sports appear in the betting slip. The betting slip offers the possibility for simple bets or combined with just a simple click and also you have the option to check a box to auto accept odds changing. Accepting odds changing can be a good thing or a bad thing at the same time, it depends on the match. But in some case the potential win can be increased considerably. Another option that is pretty cool from our standpoint, is the fact that you can filter the games by 3 views called Pro vies, Popular and Main. Also the filtering capability goes even in the subcategories of the sport type (you can choose only the matches from a certain tournament). Also you can see livescores by click the link placed in the right side if the screen (a non intrusive popup will appear) This level of granular control it’s not that popular but it should be. It allows you to take full control of what you are seeing and eliminate other distractions. In terms of the sports that are available for betting, we can see the all popular Football, Basketball, Handball, American Football, Cycling, Darts, Formula 1, Snooker, eSports and others, plus special categories like Music and Film. That’s about it in terms of the pre match betting, now let’s take a look at Live Betting. 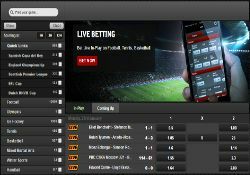 Live betting can be accessed through the In-Play menu button. Here are a number of sports available for live betting, although we must note the fact that the matches available for each sport can vary from day to day, furthermore, the sports offering is fairly restricted. But the majors ones like Football, Tennis, Basketball and Darts are available for live betting. If the live match is available on TV, an icon will appear on the side and by clicking on it you can watch the match. In the calendar you can see all the upcoming matches for each sport available and the granular filtering is available here also, offering the user again the control for the interface. To place a bet is standard. Click on the odds and they will appear in the betting slip. We commend this far and we really like what we are seeing, but let’s go on with our review. The Casino section on the website was launched at a later time then the sportsbook one, but this doesn’t mean that it’s less polished or offers an incomplete experience, on the contrary. Here are a wide variety of video games meant to satisfy the needs for most consumers. The categories are listed again the left side of the screen and we can see here Video Slots, Roulette, Jackpot, Table Games, Classic Slots, Blackjack and of course Video Poker. Video slots is the category with the most games, the total number being over 400. In terms of the themes, they are varied. Some of them are adaptation for popular casino slot machines, with similar rules and at the same time others are new adaptations all together. The games are developed and maintained by Quickfire, which is a subsidiary for Microgaming. You can expect the games to run smoothly without lang, the loading times are very decent and at the same time being really light on the computer’s resources. You may say that the performance of the games and resources consumed is not really that important, but if you have a computer that is a few years old your perspective will change. But we didn’t noticed any weird behavior in our time of testing. We tested the games on 3 browsers: Opera, Chrome and Safari. Another huge plus that we found and it’s not that often seen in this section on other betting websites, is the fact that the grand majority of the games are available for testing. So you can have a taste of the look and feel without being obligated to create an account and enter a valid payment method, which in some case can be frustrating, when all you want to do is oversee the games. Big thumbs up from us! When you hover on the games you can see the minimum bet and the maximum one. The jackpot is shown only for the jackpot type games. In large is a solid Casino experience that offers a large number of games making the experience complete. If offline betting doesn’t interest you that much, you can always opt for the Live Casino one. The Live Casino category is one of the largest we have ever seen on a online betting website, the number of games totals at near 50. Yes, 50 Live Casino games! The game types range from Roulette, Blackjack and others like Baccarat. Each game type has a few variations that will ensure you boredom won’t be a thing. The main difference in Live casino from the Offline casino section is the fact that you have your own dealers that operate the game, seeing him through a live video feed. For some users this type of betting environment is more interesting and thrilling (it really is, trust us) Here there is no test mode available, you need to create an account in order to enter a room. Betsafe offers a solid betting experience with a lot of options for the user, we were pleasantly surprised that a platform that is this young offers that large amount of games in different iterations. Really nice! But again, let’s move on to the next section. Poker fans you are all set on Betsafe. The website, as any other respectable betting platform, has a section dedicated to Poker. Being such a popular sport among the users is perfectly logic to implement a standalone section. By doing so no only the clutter is avoided, but the user will know where it can find it without any struggles. On the section you can see some of the competitions that are taking place or took place, also the download links for the client. Another interesting aspect is the fact that there are a lot of informative materials available in the section and they can help you learn poker or educate yourself to become better at the game.Video tutorials are also present. The Poker client is available for Mac, Windows or even mobile devices. Betsafe is one of the few websites that offers a Poker client for the Mac. This says alot about the company in general. In comparison, the grand majority (we are bold enough to say that more than 85% of the platforms) of online betting websites don’t offer a poker client for other operating systems than Windows. This is one of the most common mistakes we’ve seen. By not doing so, the users that has another operating system are force to reach another platform to game on, even though the current one is more than decent. A big thumbs up for Betsafe for putting the consumer first. Also, if you are on a Linux machine you can enjoy a table of poker thanks to the availability of the poker client inside the browser (this is the number two thumbs on a short amount of time). When we look at the gaming experience things are starting to look better and better. The client is design around the user’s needs, again. 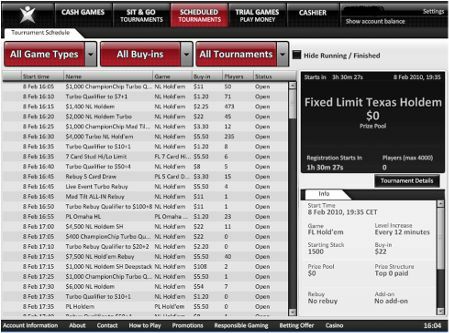 All the major filters are placed in big buttons above the available poker tables list. You can find here games like: Texas Hold’Em, Omaha, 5 and 7 card Stud, 5 card Draw and Razz. 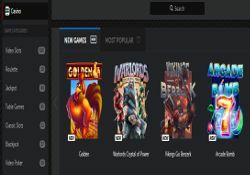 After selecting a game type, the available tables will appear in the middle of the screen with all the relevant info you may be interested in. In terms of stakes they can be as low as 0.10$. If you played poker on Betssons, the client will look familiar to you and there is no mistake. Basically is the same one. This is because Betssons owns Betsafe as stated in the intro. Overall we were pleased with the Poker category and we didn’t encounter any unexpected behavior from the app. Virtual Sports are a relatively new section in the online betting industry. The first implementations of this kind where encounter just a few years ago. Now they are somewhat mature and they offer an almost real life experience, but in the span of a few minutes. Not only the betting process is quicker because the matches are finished faster, but betting is simpler in this category just because you don’t have to know anything about the team’s history, players and so on. But enough with the small talk, let’s focus on Virtuals category available on Betsafe. The sports that are available here are Football, Basketball, Tennis, Dog Racing and Horse Racing. Matches or races are placed in the middle of the screen with the Live Score Table and below them you can see the odds for the games. The screen is broadcasted in the left side of the websites page and the matches are just a few minute long (a countdown timer is displayed). A quick note, is the fact that you need Adobe Flash Player in order to be able to see the stream. The stream runs smooth and the betting process is standard. As said above, this is a section perfect for those who want to have a little bit of fun but don’t want to waste time knowing the teams and players. Also the potential of winning can be high in some situations. Betsafe offers a extremely straightforward account creation process. The friction in this context being minimum (friction is a term used in the online websites that defines inconveniences that user experience in different situations like: buying a product, submitting a form and so on) you just have to click the big green Open Account button in order to start placing your bets. The registration form is in one single page and it takes just a few minutes to get it completed. After that account has been verified and a valid payment method was enterd, you can start placing your investments. 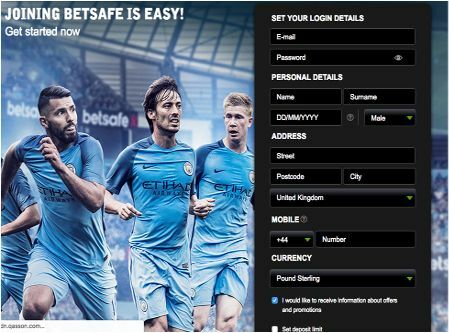 As you may know or not, you need to be at least 18 years old in order to be able to successfully create an account on Betsafe.com. Speaking of payments, the methods available on Betsafe ar fairly vast and it should work for the grand majority of the users. Betsafe uses popular cards like Visa,Visa Electron, MasterCard, Maestro that are pretty wast in terms of the world coverage and payment services like Entropay, Neteller, Skrill, Citadel, Paysafecard that as well are available in the most supported countries, also the good old Bank Transfer is present. The options available are decent, but we’ve seen more on other platforms. This is not a good or a bad thing, we are just saying that they can do better. As a note: it is possible that some of the payment methods have fees. Online security and privacy are major points to check for a betting platform. If you as a betting website are not offering a solid user account protection and transaction encryption you are in really big trouble. But Betsafe manages to not only protect the users data and finances, but also is offering a large variety of games, sports and gambling activities that are optimized and presented in a futuristic matter. Not only is it safe to bet on Betsafe (pun intended) but is one of the best betting websites that ve we review. There are a view quirks here and there, nothing major though. That being said, we encourage you to give the website a try or if you already did, please leave a comment below explaining to us how was your interaction with Betsafe.